In honor of Valentine’s Day, these couples are sharing what they love most about their NeoLife business and how working together is the greatest blessing. “NeoLife has been such a blessing in our lives, giving us the privilege to travel the world together, to romantic Venice, exotic Cancun & Hawaii, beautiful Mauritius, amazing Dubai. To fly every year to visit our family across the world, to earn global residual income, to empower people to live healthier, wealthier lives – through NeoLife, as a couple is priceless. “Before NeoLife we never got to travel, but since joining NeoLife we’ve been able to travel the world to places like London, South Africa, Puerto Rico but our favorite destination is Cancun, Mexico! We do the business part-time and the extra income allows us to pay for our kids college education, and to buy my mom 2 vehicles – one for in Mexico and the other for the US. And this is just the beginning for us, we are working to get to the Diamond Lifestyle Retreat! “Shandell and I are excited that NeoLife has brought us closer together as a couple, our communication with each other has become better and before NeoLife we weren’t ever able to take vacations or get away. And now we’ve already been to Los Angelese twice and Cancun in our first year! The residual income has taken financial stress off of us and now we are able to start paying off our debt. We can’t believe that we’ve found a career that allows us to build relationships, travel and impact lives. “Vice President of Sales, Josh Clark introduced us to NeoLife 16 years ago during a time when we really needed something to do together. We also had many health challenges to overcome and needed more money. Thanks to the excellent, whole food NeoLife supplements, combined with a healthy diet and lifestyle, and God’s grace, we were able to get well and stay well. The additional income from NeoLife really helped. It pays for all our supplements, our cars, and also affords us at least two exciting adventures every year: the NeoLife Convention and the World Team Lifestyle event…always in fun and beautiful places. The best part of all, though, is that NeoLife gives us a common purpose of helping people grow more healthy physically, spiritually & financially. On February 12th, we will celebrate 40 years of marriage. How grateful we are that with NeoLife we can stay healthy and slow down aging and look forward to many more years of helping others do the same! “It’s not everyday that you meet your soul mate, and it’s not everyday that you get to work with your soul mate/best friend doing what you both love most, impacting lives. Having a common passion for health, helping others, leading, and a desire to travel the world; NeoLife gave us the perfect opportunity to go and chase our dreams. We have learned a lot about each other in such a short amount of time and the cool thing is we get to grow together. Time freedom has allowed us to pour into family, friends, and God; The important things in life. There’s nothing like hearing of a friend’s results and looking at your spouse both smiling ear to ear because we did it, we impacted another life. Thanks to NeoLife we get to love each other, and love people to the point of changing the world. Everyone was created on a purpose for a purpose and NeoLife allows us to live out our purpose as a couple. 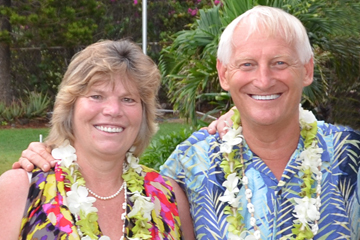 “For 33 years we’ve been part of the NeoLife family. Since Jim overcame brain cancer through natural healing, we have endeavored to help others improve their quality of life with the powerful nutrition from NeoLife. Jim’s people skills and Pat’s organizational skills combine to form a strong, balanced business, with enough flexibility to travel and spend time with family, too. We love helping people get well spiritually, emotionally, and physically through nutritional counseling. NeoLife has the flexibility to travel and spend time with our family. “Since NeoLife became part of our daily routine, we’ve both been in better health, happier and we both definitely have more energy! Building our NeoLife business has changed our lives and our health – no longer needing to nap or spend the entire weekend catching up on sleep missed due to previous hectic schedules. Now we have so much more QUALITY time together! Every Sunday morning to sit and enjoy a coffee together outside our home and we talk about our future, ideas that will help others change their health and financial situations, often we also chat about the people we met or something that we came across that inspired us, and we always set our goals for the week – personal AND business. It’s nice to wake up next to the person that you know is going to motivate you to reach them! Our NeoLife business has definitely brought a new exciting adventure in our life and we enjoy every moment of it – together. “NeoLife is our family business! We make it work as a family for our family! We love that we get to work together, travel together and grow together. Thanks to NeoLife we have a vehicle to building our family’s financial freedom. It is rewarding to know that it’s our business and it is a blessing to be able to make such a contribution to people’s health and lives. We recently had our first child and since I am self-employed, Max was able to take 28 weeks of paternity leave and be home with us. To me, being home to raise our children is one of the greatest blessings. Want to learn more? Click here to watch a 3 minute video. For any entrepreneurs out there who have a passion for sharing good health…NeoLife is redefining the world of startups. Put simply, it’s like a tech start-up, but with nutrition. There are low barriers to entry because NeoLife provides the infrastructure that any successful business needs, as well as consumable products, and a compensation plan. So instead of having to raise hundreds of thousands of dollars to get started, it makes entrepreneurship accessible to everyone. You can own your own NeoLife business and it can be passed down as an income-generating asset to future generations. For more information please visit http://www.neolife.com/ or call 800.432.5862. To learn how to build a foundation of good nutrition for you and your loved ones, visit http://www.shareneolife.com/.